Constructed a ground blind with natural vegetation and took this 5pt at 16yds with my Blacktail Elite Recurve, Wensel Woodsman broadhead and carbon arrow. Nice deer, ain't ground huntin' fun? Poor folk with poor ways, but rich just the same. A real rush when they are at eye level. Good job! 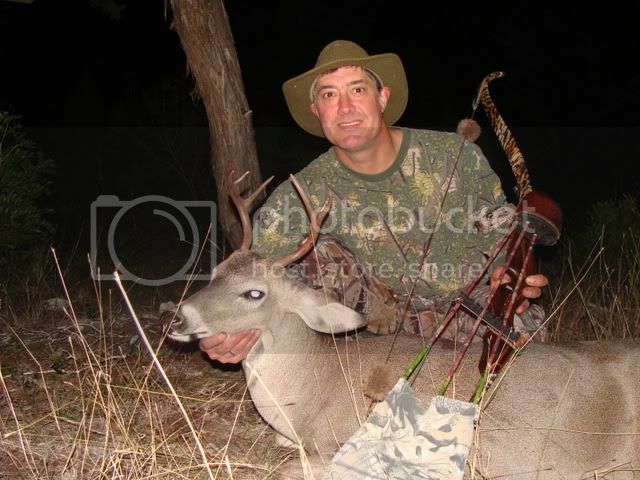 Nice deer Wayne and a good picture. I bet that fletch-cover is hiding a perfect double-lung shot isn't it? Congrats on the ground hunting. Adds new excitement doesn't it? Boy, what a beautifully sleek and silky coat on that buck.